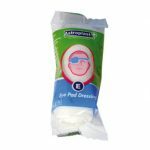 Eyepad with a sterile, non-absorbent pad with extra long, fast edged conforming bandage. Size: 7.8cm x 6cm. To avoid movement in damaged eye it is advisable to cover both eyes and seek medical help.